Click pics for close ups! Let's start 2010 with something unique. Frank Verrilli's Dualtone S utilizes a combo maple/rosewood fretboard in order to soften the high string response while maintaining snap at the low end. Why not? 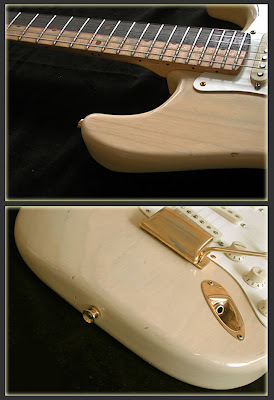 This is something I'd expect with an upcoming Eric Johnson Strat. Anyone familiar with the process involved in arriving at last year's EJ RW release will appreciate how Verrilli may have cracked the code in yet another way. 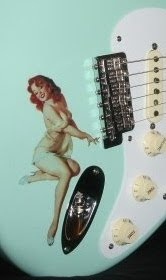 In the demo clip below, Austin guitarist Lance Keltner expands upon the idea. Verrilli doesn't just stop with the fretboard thing though, these guitars come with a ONE piece body, in your choice of alder or ash, super thin nitro finishes and Fralin pickups. 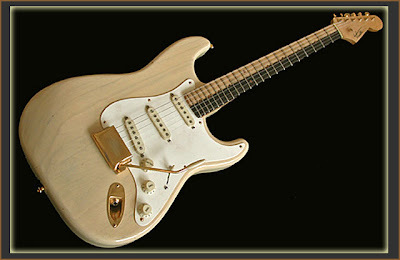 Otherwise, the overall vibe is serious 50's Strat. You may also be surprised at the price. 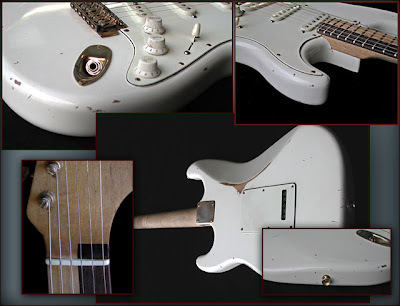 Frank Verilli Guitars are available through Destroy All Guitars -- purveyor of several fine boutique lines.